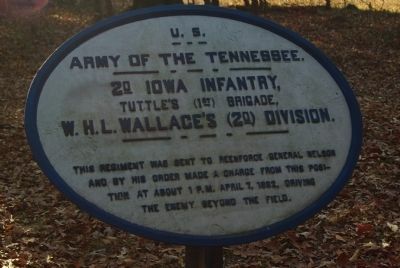 This regiment was sent to reenforce General Nelson and by his order made a charge from this position at about 1 p.m. April 7, 1862, driving the enemy beyond the field. Location. 35° 7.953′ N, 88° 20.002′ W. Marker is in Shiloh, Tennessee, in Hardin County. Marker is on Sunken Road 0.1 miles west of Hamburg-Savannah Road, on the right when traveling west. Touch for map. Marker is about 100 yards southwest of the Bloody Pond in Shiloh National Military Park. Marker is in this post office area: Shiloh TN 38376, United States of America. Touch for directions. 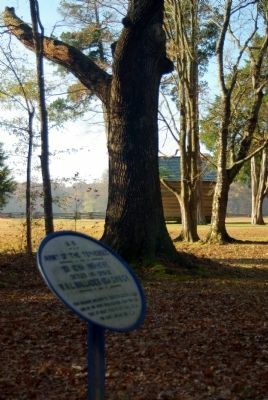 Marker with William Manse George cabin in the background to the southwest. 500 feet away); Mann's Battery (about 500 feet away); Ross' Battery (about 500 feet away); Gladden's Brigade (about 500 feet away); 28th Illinois Infantry (about 600 feet away). Touch for a list and map of all markers in Shiloh. More. Search the internet for 2nd Iowa Infantry. Credits. This page was last revised on June 16, 2016. This page originally submitted on November 22, 2010, by Allen Gathman of Pocahontas, Missouri. This page has been viewed 493 times since then and 5 times this year. Photos: 1, 2. submitted on November 22, 2010, by Allen Gathman of Pocahontas, Missouri. • Craig Swain was the editor who published this page.